U.S DS160 Visa Application Form – In this post we are going to teach you how to fill out and submit the US Non-immigrant Visa Application (DS-160) form. After this process, you can move on to other steps like paying your visa fees and scheduling for an interview at the US embassy. Let’s go there. A computer or laptop that is connected to the internet. Your international passport (or a photocopy) handy. You know what type of visa you are applying for. Now that you have made available the aforementioned, follow me as I fill out an application form on the internet using Nigeria as my home country. However, if you can not fill out this form on your own, contact us on 07033378184 or via email: assist@travelvisa.ng.We will be glad to help! On the next page, you will be required to secure your application by providing a security question and answer of your choice. For this illustration, our security question will be “What is the given name of your mother’s mother? Bear in mind that you will be required to provide your security answer if you fill out this application half way and have to come back to it later. As soon as you click on “Continue”, the first section that appears is the “Personal Information 1” page. As soon as you are done, click on “Personal 2” to enter the second phrase of this form. You can also take the application “back” or “save” to come back to it later. Click on “Next: Address and Phone” to enter the next page. Indicate if your passport has been stolen or lost before. If it has, tick “Yes” then state the previous passport number (if you can remember) and explain how it got lost. Tick “Yes” to show that you have made specific travel plans. Indicate arrival and departure flight if you know it. Indicate who is paying for your trip. If you select that “someone else” will be paying for the trip you will need to give the name and contact details of the person or organization. Click on “Add Another” to add more traveling companions. On this page, you will be answering questions based on your previous travel to the United States of America. Provide complete and accurate information to all questions. Provide explanation where necessary. Click on “Next: U.S. Contact” when you are through filling out this page. Here you need to provide the contact details of the person or organization you are going to meet in the United States. This includes their full name, relationship with you, contact address, phone number and email address. When you have filled out the spaces provided, click on “Next: family”. On this page, you will fill in information concerning your biological or adopted parents. You are to give your parents full names, date of birth, if they have ever been to the U.S. You will also have to indicate if you have any immediate or far relatives in the United States. On this page, you will fill out the personal information of your spouse (if you indicated that you are married). This information includes their full names, date of birth, country of origin, city and contact address. On this page, you are to state your primary occupation. If your field is not on the list, click on “Other” and then specify your job title in the box that will be provided. You will also State the name and contact details of your present employer of school. If you are employed, you will also be expected to fill out your monthly salary in our local currency and your job descriptions in the box provided. If you have attended a secondary school/university or a vocational program tick “Yes”. And provide the Name, contact address, your course of study and duration. Click on “Next: Work/Education: Additional” when you are done. When you are done click on “Next: Security and Background”. On the next few pages, you will be asked questions to provide security and background information about yourself. These questions covers your physical and mental health, crime records, affiliations, etc. You are to answer these questions correctly. These security section runs from part 1 to 5. When you are done answering a page, click on ” Next: “Security and Background” until you get to the “part 5” of the section. After you have gone through the Security Part 1 to 5, next is the page where you will upload a head-shot photo of yourself. Click on “Next: Photo” to get started. Bear in mind that for this sector, you must have a digital copy of your passport on your computer to upload to the application. 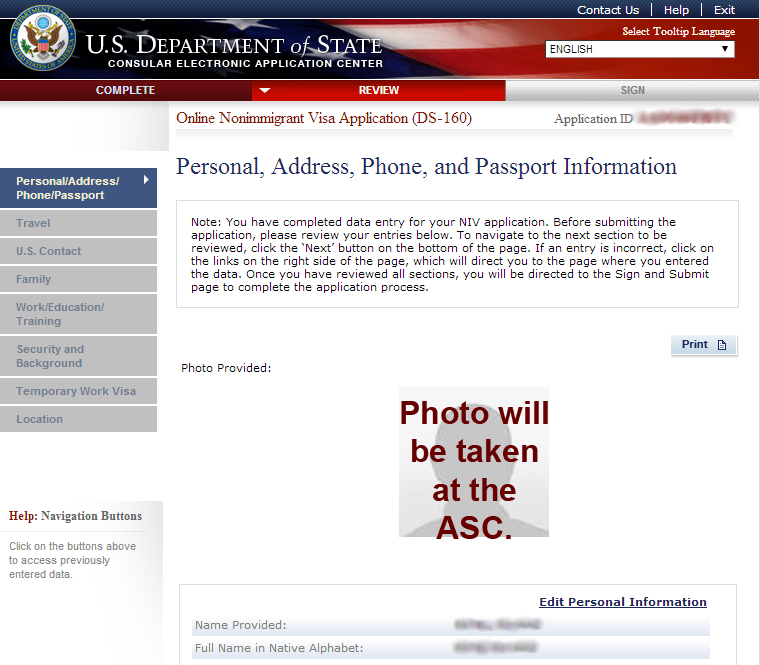 The digital image must adhere to a required set of specifications given by the U.S. embassy. If the photo you submitted does not meet these standards, you will be required to submit a new passport photo with the application. Or come along to the visa interview with your confirmation page and passport. Here, you are to go through your application to make sure you fill it out correctly. This is your last chance to correct whatever mistakes you might have made. When you are done with this stage you will move on to the final section, which is the confirmation section. On this page, you will confirm the authentication of the information you provided in the application form. This will be done by indicating whether you filled out the form yourself and giving your international passport number as an e-signature to that effect. And that’s how to fill your U.S. DS 160 Application form. If you have a problem with filling out this form, use our comment area to tell us about your problem and we will respond to you quickly. If you need assistance with filling your U.S DS160 Visa Application Form. You can also contact us on 07033378184 or via email: assist@travelvisa.ng.We will be glad to help! Thank you for this information. At what point do I fill in the details of the hotel that I booked and other activities I planned to do in the US. If a relation wants to send me an invitation letter who should the letter be addressed to and what information must be stated in the letter to prove that she can cater for my stay? thanks for this explanation about how to fill ds 160. please as a business/trader what to write in the job discribsion in the box and on the monthly income is it the total sales for the month or the profit ? please i ve submitted the application and also booked an appointment but ve not up load the pictures. i need to complte the rest of the information. can i still do that. Thank you for this information. It is clear and simple. You have done a great job! My question is base on monthly income in local currency. I am a businessman. Is it the amount I paid myself that I will input there because of the clause written on the form, “if employ”? Or the total sales for the month? Can you please do an extract like the above for F1 student visa. Good day and thanks for this awesome step-by-step explanation of the U.S VISA application process. however, I have a slight challenge with the form, At the point where I have to fill in the WORK/EDUCATION/TRAINING, instead of having the; present, previous and additional, I only see present. I was not giving the options of previous and additional. What do you thing is the problem? Good morning. please kindly provide guide for uploading of family memebers passport and letter of invite on the portal. i cannot see the page. Thanks for the information, I really appreciate that, you’re one in a million, please I will really appreciate if you can forward the whole information into my box rufusadebayo2@gmail.com, and again what is the procedure for drop box please, is it going to be the same way as first timer? Thanks for this information. Please I want to know maybe February 2019 still available for appointment date ? And also what documents did I need to bring for interview day ? Thanks for the info, please visitation letter from a friend, is it the same as B1/B2 or there is another name for it. Going with a family member(my kids) do I need to purchase visa or pay visa fee for them too and also fill D160 form for them too. Thanks looking forward to your reply.